Conforms to international legislative requirements. INTERNATIONAL Rectifier (IR) has introduced the IRAC1150-D2 Power Factor Correction (PFC) Control Design Kit and added a PFC design tool to the myPOWER online design centre. It features the IR1150 µPFC for ac-dc PFC and is a small, 1.1 inch-square, fully-assembled PFC control circuit that engineers can drop in to an existing power supply, replacing its old continuous conduction mode (CCM) PFC circuit. According to senior vice president of sales at IR, Stephen Tsang, this reference design allows designers to immediately see the benefit of IR's one-cycle control performance without a major redesign or spending a lot of time evaluating and prototyping a new PFC circuit. Designing with the IR1150 is simplified with the aid of a two-step process online design tool - users simply enter system requirements and the design tool generates a complete bill of materials. The design tool simplifies active PFC development so designers can replace old, passive solutions with poor power factors and low efficiency with modern, more efficient solutions. 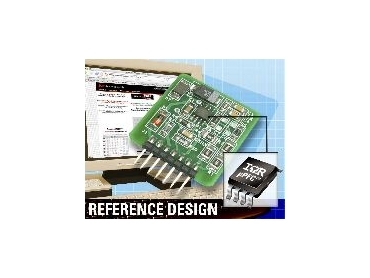 The reference design kit comes complete with an assembled and tested reference design board, five IR1150STR ICs, two 8ETX06 Hyperfast rectifiers, a user’s guide, application notes, device data sheets and printed circuit board files. Features of the IR1150 IC include a compact SO-8-package with a lead-free option, which cuts PFC control board space as much as one-half and enables a simplified and flexible high density solution for computing, consumer electronics and home appliances from 75W to 4kW. Featuring IR's one cycle control (OCC) approach, the device delivers the performance of continuous conduction mode (CCM) PFC with the simplicity, reliability and low component count of a discontinuous current mode (DCM) circuit for PFC applications. With unity PF as the ultimate goal, the IR1150 enables 0.999 PF with only 4% total harmonic distortion, enabling ac-dc applications to conform to international legislative requirements, such as IEC 1000-3-2 in Europe, JIC C 61000-3-2 in Japan and the China Compulsory Certificate (CCC) for products using more than 75W. As manufacturers implement PFC in response to these energy standards, the IR1150 control IC simplifies PFC solutions and enables a single design that can be used worldwide.